Dr. Gregory Grillone receives prestigious award! 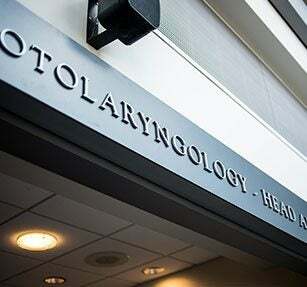 Dr. Gregory A. Grillone, Professor and Vice Chair in the Department of Otolaryngology - Head and Neck Surgery, received the Edmund Prince Fowler Award that is given once each year by the Triological Society to the candidate who has done the best basic science research. Dr. Grillone’s thesis entitled The Color of Cancer: Margin guidance for oral cancer resection using elastic scattering spectroscopy (ESS) showed that EES can be used to assess adequacy of resection margins in patients having surgery for resection of squamous carcinoma of the oral cavity. Congratulations to Dr. Grillone on receiving this much deserved recognition for his excellent research work. 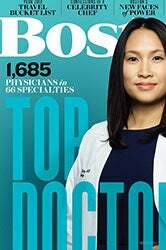 Boston Magazine has released its annual "Top Docs" list for 2019, which recognizes 113 Boston Medical Center (BMC) physicians in 43 specialties as being "tops" in their respective fields. 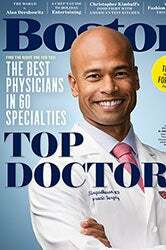 As in years past, BMC is strongly represented in numerous fields and specialties, and the care that these physicians provide to BMC's patients and the community is exemplary and the recognition is well-deserved. 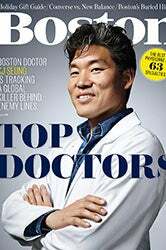 Boston Magazine has released its annual "Top Docs" list for 2016, which recognizes 70 Boston Medical Center (BMC) physicians in 35 specialties as being "tops" in their respective fields. 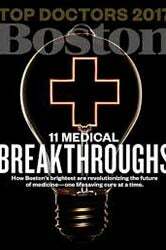 In addition, BMC’s Long Life Family Study was highlighted in the Top Docs issue, showcasing BMC’s commitment to research that will help improve the health of future generations. The care that these physicians provide to BMC's patients and the community is exemplary and the recognition is well-deserved. Gregory A. Grillone, MD uses a Multidisciplinary Approach to Cure "Mystery Illness". Read the full story. Anand Devaiah, MD served as a volume editor for Rhinology and Endoscopic Skull Base Surgery, available through Thieme. Dr. Devaiah also served as a volume editor for Otology and Neurotology, available through Thieme.